If you are planning on leaving soon avoid putting more wood on the fire. You should give plenty of time, around 30 minutes, to extinguish your fire. If possible you should allow the fire to burn down completely so only ash remains. Pour water over the fire. If it smokes a lot let it burn down some more then pour more water over it. Water should be poured over the entire fire pit including any boundary logs or rocks. Even if it is not glowing it is possible it could be hot enough to reignite. Use a stick to stir the ashes in the fire around and to ensure all of the fire has been covered with water. If needed add more water. Use the stick to poke holes in the ground and allow the water to soak into and cool the soil beneath the fire. Scan the area around the fire pit to ensure no embers or sparks have escaped. Feel the fire pit area for hot spots and add more water if needed. If this is a permanent fire site stack and remaining wood for the next person. If it is a temporary site scatter remaining wood around the area. Remove ashes from the fire and dispose of appropriately in the area. There is no reason that children cannot be involved in extinguishing the camp fire. The steps above can easily be adapted to suit age and ability, pouring water on the fire with a small watering can for example. Even if not directly extinguishing the fire children can be involved in collecting the water and spreading the ashes. The only step from above that I would be more cautious about using with children is them using their hand to test for hot spots in the extinguished fire pit. 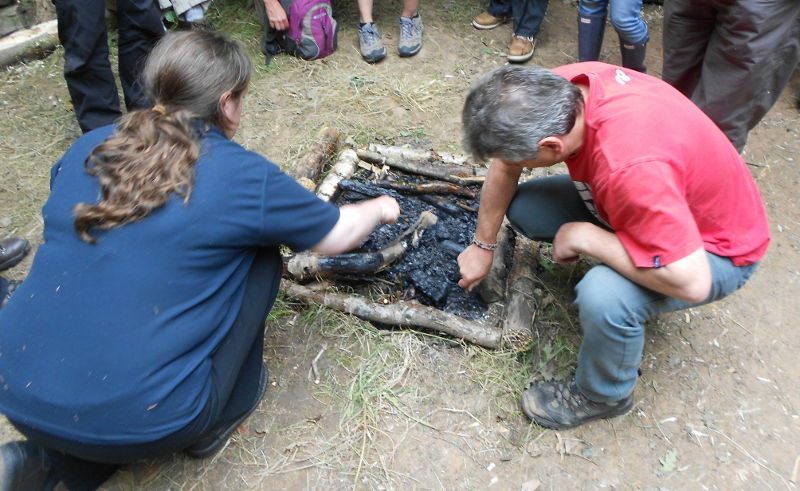 The extinguishing of the fire can be made into a ‘ritual’ and used as a reflective activity. We completed a nice reflection during my training week where we each poured a cup of water over the fire and made a wish. This could be easily adapted into asking the learners what they’d enjoyed or learnt that session. It’s definitely something I’ll repeat when I’ve got a site I can use fire on.